In our preview of Sunday's now-concluded emergency EU meeting on refugee policy which the FT dubbed "The summit to save Merkel", we said that the German chancellor fate could be decided as soon as today should a newly populist Italy present a set of insurmountable demands on how to deal with Europe's migrant problem. And judging by the opening salvo, the odds of Merkel's political career just slumped after Italy’s prime minister Giuseppe Conti demanded the EU rip up its system for dealing with migrants, laying bare seemingly insurmountable divisions in the bloc over migration policy. The hastily-gathered meeting, a segue to the formal EU summit scheduled for June 28 in which migration will be the key topic, was requested by Berlin as a chance for Ms Merkel to press for stronger powers for countries to send back asylum seekers already registered in another EU country: a key condition in an ultimatum that was handed to Merkel last week and which threatens her tenure as chancellor. In other words, Merkel was testing the water to see how much of a political case she can formally make at the international level on Thursday, one that supposedly saves her career domestically. She was, however, stunned after the Italian prime instead called for "radical change" in the EU’s so-called Dublin principle that makes frontline countries such as Italy responsible for dealing with asylum claims and allows for registered asylum seekers that move on to another country to be sent back to the state they landed in. 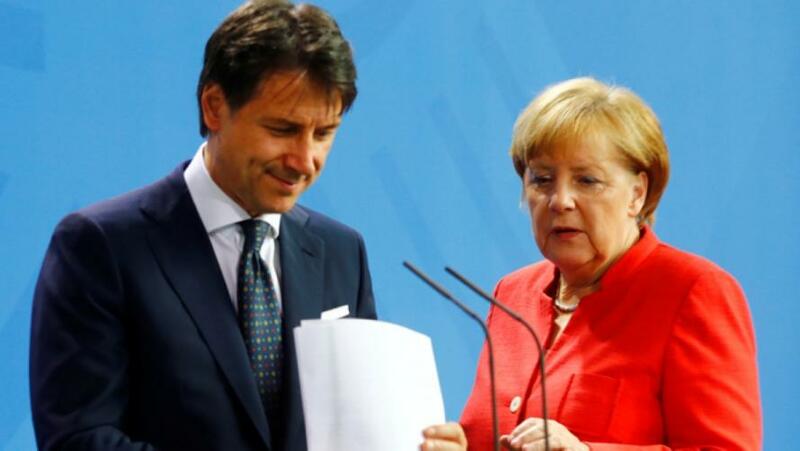 Italian Prime Minister Giuseppe Conte and German Chancellor Angela Merkel. As the FT first reported, in an eight-point plan presented to leaders on Sunday, Conte called for “severing” the link between the “safe port of disembarkation” and the “competency to examine asylum rights”. The reason why is simple: Italy, along with most other peripheral European nations, tends to be on the short-end of that trade, as Rome ends up stuck with any migrants that cross the Mediterranean to arrive in Italy. At the moment, when migrants arrive on Italian soil only Italian authorities can process their asylum application. Rome wants this to be broadened to other EU countries, a step that would in effect end a 25-year system for handling asylum claims. “Whoever arrives in Italy, arrives in Europe,” the document reportedly said adding that “we must reaffirm responsibility and solidarity. Schengen is at stake,” referring to the possibility that border-free movement across some EU countries could be threatened if no deal is reached. Needless to say, Italy's initial negotiating positions, assuming there is space for leeway, is a disaster for Merkel, who is facing precisely the opposite demand from her coalition partner, Horse Seehofer of the CSU, who has demanded that Germany push back more migrants to their original port of call, i.e. Italy. The emergency meeting took place as Europe's existing migrant system was is in chaos, after Italy refused to accept any more refugees: on Sunday, more than 350 migrants were stranded in the Mediterranean Sea after being rescued by Mission Lifeline, a German charity. Lifeline’s own vessel carrying 239 people, was left drifting off Malta, after Italian authorities this weekend insisted it should dock there but authorities in Valletta refused. Meanwhile a Danish cargo ship, the Alexander Maersk, which had picked up 113 migrants with help from Lifeline personnel, was outside the Sicilian harbour of Pozzallo, having been left there overnight without a chance to dock. There was more bad news for Merkel. Conte also proposed that “protection centres” for processing asylum claims should be set up in other EU countries - such as Germany - as “hotspots” to avoid overcrowding in frontline states - such as Italy. France and Spain have backed a similar plan but the idea has been criticised by the Netherlands. And just to make sure the complexity of the problem facing Merkel is truly off the charts, today's discussions did not involve the four Visegrad countries — Poland, Slovakia, Hungary and the Czech Republic — who have all resisted calls from western member states to accept refugee quotas. This assures sheer chaos during Thursday's refugee summit, where a joint resolution is virtually impossible. To be sure, the four European nations may reach a compromise, but only if Germany promises more funding, which is likely a non-starter for Merkel's political allies. That said, there was a glimmer of hope for a solution: diplomats pointed to some signs of emerging consensus on external border policy, with a number of member states backing plans to take migrants rescued at sea to “processing centres” in north Africa and other non-EU countries where they could have their asylum claims reviewed. In other words, migrants picked up from Libya would be processed... in Libya. The policy, which non-governmental organisations warn would face major legal and practical hurdles, is designed to discourage migrants from making perilous sea journeys. Of course, such a policy would also result in the immediate collapse of Europe's progressive, liberal facade, and be seen as a momentous victory for populist forces across Europe, whether or not Merkel keeps her job. And while hopes of an agreement on Thursday are sinking fast, Dutch prime minister Mark Rutte said he hoped EU leaders would use the meeting to thrash out their differences. "I hope that at the end of today the steam is off, people discussed their controversies so we can reach a deal." Unfortunately for Merkel and Brussels, that is one particular hope that will certainly need rescuing in the rising sea of Europe's populist backlash against globalism, the ironic result of Merkel's own actions.